Orbea, a legacy road bike brand from Spain, has jumped into the market with an impressive lineup of carbon e-bikes (they call “hybrids”) that, thanks to a newly developed powerplant, offers the bike with a profile as svelte as any traditional carbon road bike. The difference is their use of a rear hub motor versus the more popular mid-drive units used by a majority of their competitors. Orbea actually launched their new e-bike platform last year in Europe with an aluminum frame. 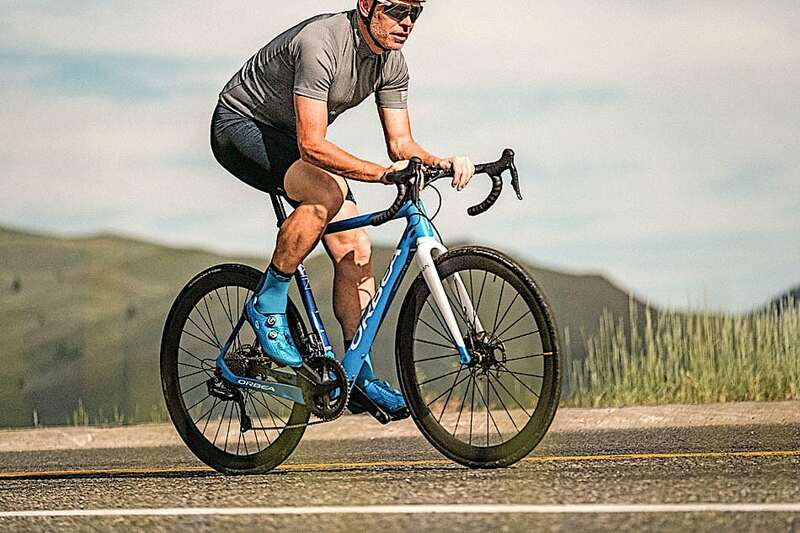 With their exclusive one-year deal with their motor vendor about to expire, Orbea needed to go big, and they are now boasting a five-model line of their carbon e-road bikes. As has become the latest trend with e-bikes, especially e-road bikes, Orbea gave some thought to the bike’s overall aesthetics and stashed the battery inside the downtube. Key to the Orbea Gain’s talking points is its use of a rear hub motor from a Spanish automobile company called EV Motion. 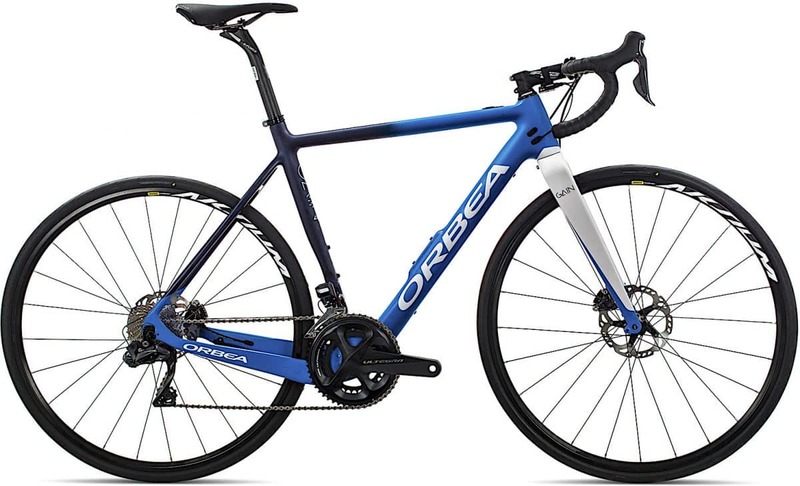 With a claimed weight of 25 pounds, the Orbea Gain had the closest ride quality to any non-powered road bike. The on/off and power mode button is located on the top tube with the charge port found at the base of the downtube. The Gain’s charge port is located at the base of the downtube and uses a simple six-pin plug-in. There is also an accessory battery (shaped like a water bottle) that can be used to extend the bike’s range. Orbea teamed with Mavic for some e-bike-specific 32-spoke wheels. The higher-end models will use the e-bike version of the carbon Cosmic Pro, while the entry-level bikes will use the aluminum Aksium. We were told that there was room to run up to a 40mm tire. If there was one word to describe the Gain’s operating system, it would be “simple.” Both the on/off and power mode functions operate with a single push-button located on the top tube. There is no separate display function other than a sequence of different colored LED lights to indicate which power mode you’re in (clear/off, green/fast, orange/faster, red/fastest) that you have to sequence through. Simple as it is, it was hard to be sure which power mode you were in while riding. Similar to texting while driving, changing power modes while riding requires you to take your eyes off the road to toggle through the color-coded modes. To avoid those moments of fumbling with the top tube-mounted power mode button, our advice is to set it before you start pedaling. Orbea stressed that one of the more important features pursued with the Gain was to optimize the bike’s weight and handling for out-of-the-saddle pedaling. Once rolling, the Orbea Gain offered a smooth, fluid surge of power that was never abrupt or jolting. 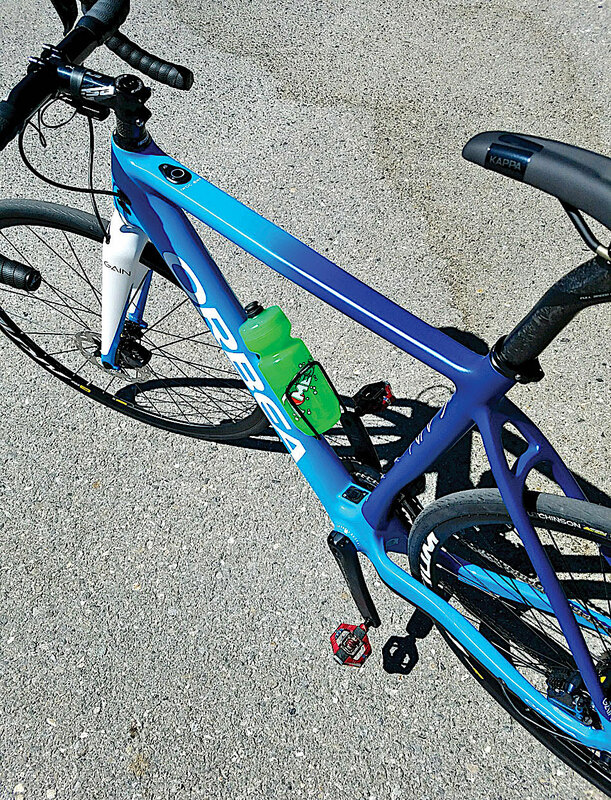 With a claimed weight of 25 pounds, the Orbea felt every bit like a performance-oriented road bike—with power assist. 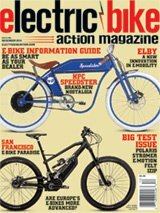 Best of all, unlike most e-bikes that weigh twice as much, pedaling on after running out of battery power would still be a manageable feat. Over the course of a few different climbs, we were able to grab at least one extra gear (and often two) every time we switched to the red mode. Four road models (each available in five sizes) will all run with Shimano drivetrains—from the $4400 model with 105 to the $8730 Dura-Ace level. Although not shown in the press material was talk of a gravel version in the works.